From Businessinsider we get the graph below. 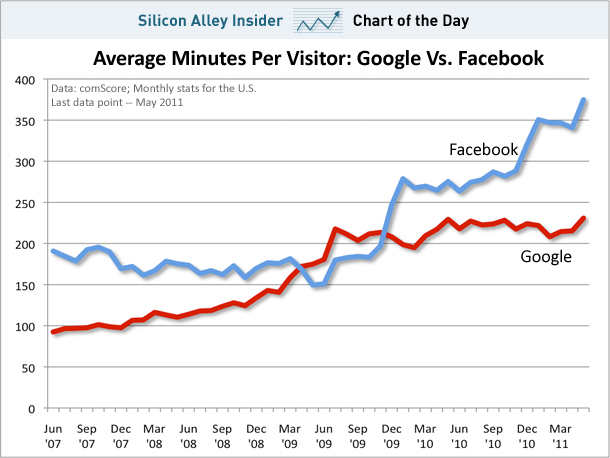 Data are from comscore and show the monthly stats of time spent inside Facebook for U.S. users versus Google (June 2011). People spend a tremendous time in Facebook. And to be fair, Google is sending you to other sites, while Facebook provides an intranet of webpages. 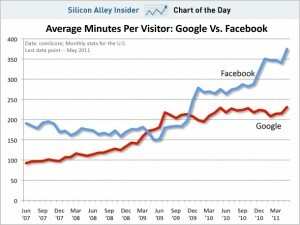 Comscore reports in May that among the top web properties in US (in terms of unique visitors) Google ranks second and Facebook fourth. Another statistic from comeScore is U.S. Online Display Advertising Market Delivers 1.1 Trillion Impressions in Q1 2011 and Facebook led this one. Overall, the social component is more and more important and Google has not (yet) been able to challenge Facebook in this domain. Orkut, Google Open Social, Wave, Buzz have been attempts but not successful. plus.google.com is the official page of this project, at the moment by invitation only. The best and most comprehensive public report on this project, called inside Google Emerald Sea, is from Steven Levy on Wired, Inside Google+ — How the Search Giant Plans to Go Social. Two recent articles talk about the use of sensors to improve people’s lives. The first article in FT Invasion of the body hackers (June 10 2011) uses the term self-quantifiers, defined as the engineers and entrepreneurs that have begun applying a tenet of the computer business to their personal health: “One cannot change or control that which one cannot measure.” The phenomenon is still niche but technology is making possible to have sensors and wireless devices together in experiences that can go mainstream making data collection completely passive. Some will even be “game-ified”, (Tim Chang) says, made as fun and addictive as Angry Birds. The idea is very simple, by listening to our body we can easily understand ourselves and improve our health and behavior. There is a conference on the subject Quantified Self conference, the first was this year, for users and tool makers interested in self-tracking systems. The second article is from Wired (July 2011) and it is titled Harnessing the Power of Feedback Loops. The feedback loop, a profoundly effective tool for changing behavior. The basic premise is simple. Provide people with information about their actions in real time (or something close to it), then give them an opportunity to change those actions, pushing them toward better behaviors. A feedback loop involves four distinct stages. First comes the data: A behavior must be measured, captured, and stored. This is the evidence stage. Second, the information must berelayed to the individual, not in the raw-data form in which it was captured but in a context that makes it emotionally resonant. This is the relevance stage. But even compelling information is useless if we don’t know what to make of it, so we need a third stage: consequence. The information must illuminate one or more paths ahead. And finally, the fourth stage: action. There must be a clear moment when the individual can recalibrate a behavior, make a choice, and act. Then that action is measured, and the feedback loop can run once more, every action stimulating new behaviors that inch us closer to our goals. GlowCap, Zeo, GreenGoose are all example of the applications that show the potential of these ideas. Apparently, not only Nokia’s platform is burning. From February to June 2011 RIM has lost 60% of its value, and had 21% drop in the share price after the Q2 results in June 17th. RIM dropped to its lowest level since 2006 after the BlackBerry smartphone maker said quarterly revenue may drop for the first time in nine years and unveiled plans to reduce jobs. Device gross margins are down to 28%, a drop of three points from the quarter before. The year over year revenue increase was driven by a 67% increase in sales outside North America. If you look only at North America, sales were down about 18% year over year. Full-year profit will be $5.25 to $6 a share, excluding some costs, RIM said, down from a previous forecast of $7.50. 74.6 million people in the U.S. owned smartphones. Basically, this is happening as the smartphone market is growing, a lot. The first Android device was launched in 2008 and the first Apple iPhone in 2007, but they changed the industry. Jean-Louis Gassée in his Monday Note blogs writes, as usual, a great post titled RIM: What Did You Know and When Did You Know It? How did we get there? The execs are partly right: RIM is an amazing success story. And the company is still profitable with about $3B in cash. But, unfortunately, they’re also dangerously wrong. RIM has been an amazing story, but its leaders have been in denial for too long, they have failed to recognized how two from-stratch platforms were able to move much faster than the incumbent, with its need to preserve the past while trying to build an incompatible future at the same time. Another great analysis is What’s Next for RIM? from Michael Mace. A computing platform runs on momentum. When the platform’s growing, there’s a virtuous circle between the growth of the customer base, the introduction of new products, and the arrival of new developers. Each one reinforces the others, and it produces strong, resilient growth. Look at Apple’s current expansion for a great example. But if that momentum breaks, the same forces that help you grow can create a self-reinforcing decline. The loss of customers reduces your resources, so you can’t spend as much on new products, so developers are less excited, so you lose more customers, and so on. To restore momentum in a faltering platform, you need a hit product. Can RIM generate one? During the second half (Sept 2010 to April 2011) RIM lost 1.8 million users (in US). RIM went from being a consistent net usage gainer to a consistent net usage loser during this 16 month period. The smartphone domain is a very competitive and dynamic market. Google Android and Apple iOs have disrupted the industry by providing new platforms in an environment in which the ecosystem is more important than the single device or list of features. And a former RIM employees says, the difference between a ‘list of features’ and ‘inspiring’ is the difference between 1st place and potentially ‘out of business’ – and this is something they need to understand – culturally. It is easy to criticize the incumbents, but transitions are very hard and include technical challenges and more importantly cultural shifts. Being comfortably at the top for long time can make anybody blind to the changes or disruptions coming, sometimes from a different industry. Recent news is the Nokia Q2 profit warning, press release May 31 Nokia lowers Devices & Services second quarter 2011 outlook and updates full year 2011 outlook. pricing tactics by Nokia and certain competitors. The stock has dropped 19% in the last 5 days, 44% from February 11, 70% in the last 5 years. And now some very good articles and comments on the topic. Get your opinion. Horace Dediu at asymco.com Does the phone market forgive failure?